TOSprint or not to sprint? TOSprint in Paris has just ended (wiki page). First of all I want to warmfully thank the sponsors, especially Olivier Courtin from Oslandia for the organization, and Mozilla France for hosting us. Once a year a bunch of hackers from projects under OsGeo umbrella, meet in a face to face sprint. This year it happenned in Paris with great number of participants (52). there was a lot of cross echanges too. My main objective, except being enough luckly to be a sponsor, was to go there and be in direct contact with upstream. This can help a lot to improve packages, and create new ones. Moreover, as one of my openSUSE’s Application:Geo peer maintainer, Angelos Kalkas was also participating, we decided to make somes changes, and improve the situation of the repository. I was one of the creator and maintainers of bacula packages on obs (Story started 4 years ago). nor time to maintain those packages. Since sometimes, bacula project has released two main major version. (7.0 and 7.2). Those packages have never been submitted to Factory, and proposed to any released openSUSE version. From one of the last upstream announcement Bacula project will deliver directly prebuild packages for major distributions. So if you’re interested to take ownership of those, raise your hands now (ask maintainer status with obs interface). I will let a grace period of one month before sending a delete request. 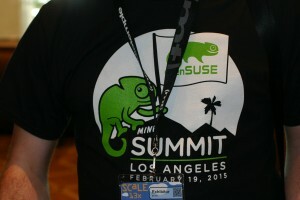 Hi Geekos, here a small summary of our Thursday February 19th openSUSE miniSummit event here at SCale 13x. Located in Century AB room, a 80 seats room. The average attendance rate was varying between 50% and 85%. Qualifying the attendance 50% or more were not related to SUSE / openSUSE, which was a good experience of question and feedback. The day started by a talk about openSUSE / SUSE Xen and openstack by Peter Linnel and Russel Pavlicek. One hour later Manu Gupta has presented all the bolts and nuts about GSOC at openSUSE. We then go for lunch, and corridor exchanges. The day continue with a Town Hall talk co-animated by myself and Peter running an open discussion with attendees. With interesting remarks and feedback from openSUSE users, and also complete foreigners. For example, the way systemd was introduced in openSUSE distribution was appreciated (having choice during 2 versions). It was an unstressfull, open and positive exchange. Freschy, punchy, funky, the kinda talk I would like to see again at OSC15. To finalize the day, Markus Feilner​ for Linux Magazine (de) talked about openQA. I found interesting the perfect mix we’ve done between openSUSE and SUSE during this day, confirming the excellent partnership we have. Let the sponsors of this day be warmly thanked to make it happened. Stay tuned for more news during this week-end. 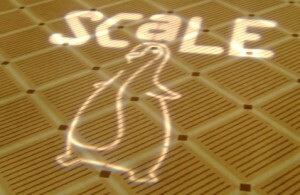 Again this year the thirteen annual Southern California Linux Expo is in the starting block. 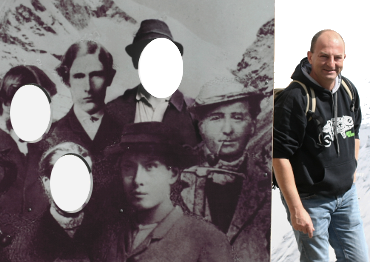 During 3 days you will be able to visit us at our booth (38,39,40). Yeah 3 booths cause we co-run the KDE and Gnome booth. The exhibition hall open Friday afternoon at 2pm. 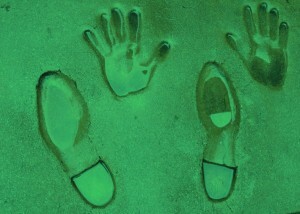 Whatever the way you come, bring your feet there and shake hands. On Thursday, no one has to miss our full day of openSUSE mini-summit, room Century AB. There will be interesting talks and also a full green hallway, We’re looking forward SUSE’s team, working together in this promising adventure. 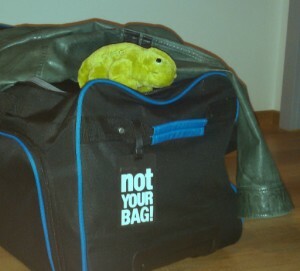 On our side Geeko is ready to cross 9.000 kilometers tomorrow. Demo laptop with Tumbleweed and KF5 is also secured.